Message on the Fairfax car tax payment site. The website that allows Fairfax County residents to pay their annual car tax has crashed on the day the taxes are due. Friday is the deadline for county residents to pay their annual personal property tax, commonly known as the car tax. But the website that accepts online payments was largely inoperable Friday. A message on the site advised taxpayers to try again later. 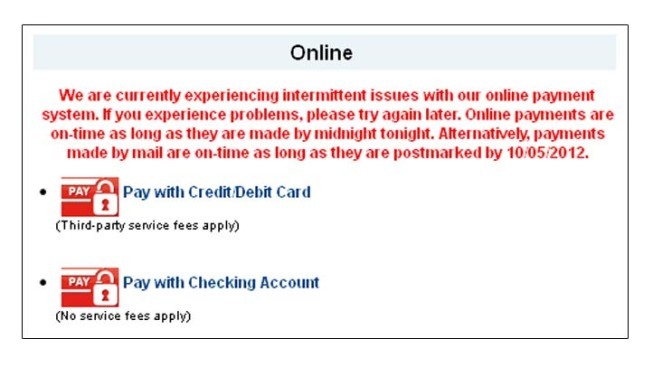 County spokeswoman Merni Fitzgerald said the county was experiencing "some intermittent problems with our online payment system." She said people who miss the deadline will still be assessed late fees even if they tried to pay online.